CHESTER, England (CNS) — Christianity in Iraq is just one wave of persecution away from extinction, said the Chaldean Catholic archbishop of Basra. 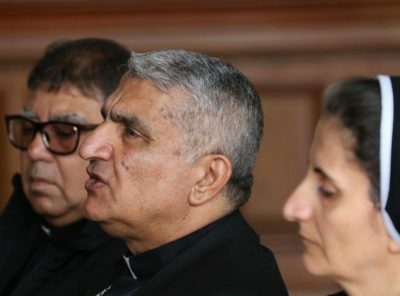 In an interview with Catholic News Service, Chaldean Archbishop Habib Nafali said there were now so few Christians in his country that the church there would disappear if it was subjected to further persecution. He said the displacements and murders of Christians over the past 15 years constituted genocide. “Another wave of persecution will be the end of Christianity after 2,000 years,” he said in the Oct. 5 interview in St. Columba’s Church. “There is a global game, and the peaceful people — the minorities — in the end will be the ones who are destroyed,” he said. He said he was fearful of renewed persecution because he believed the Islamic State terror group had not been defeated, but had gone underground. It was suspected of being behind a recent spate murders of women who had chosen to dress themselves in Western fashions, he said. “We have seen with our own eyes how they attack Christians,” he added. “If this is not genocide, then what is genocide?” he asked. Christians have lived in what was known as Mesopotamia since the time of the apostles and speak Aramaic, the language of Jesus. But the archbishop said their number has plunged from 1.5 million to just 250,000 in the last 15 years, and they now represent about 1 percent of the population, compared to 6 percent a century ago. In the decade that followed the 2003 U.S.-led invasion of Iraq, a church or a monastery was destroyed every 40 days on average, the archbishop said. “There are still more than maybe a quarter of a million of us struggling to stay in our homeland,” added Archbishop Nafali. Besides the threat from terrorism, Christians continue to face discrimination in the labor market, with many of them finding it almost impossible to get a job because their faith is an obstacle to employment, he said. He added that such factors prevented the return of refugees. The archbishop was in the U.K. as a guest of Aid to the Church in Need, the Catholic charity that helps persecuted Christians around the world.